dailyVest’s planAnalytics is a comprehensive monitoring and analysis tool for plan administrators and sponsors. It analyzes the ‘soundness’ of employer-sponsored retirement plans, models investment behavior at the plan level (all participants), and measures how well your plans are working. planAnalytics is a powerful, new defined contribution management tool that will uncover issues and trends affecting your plans -- and with that information help you with investment and communication strategies to run your plans effectively! planAnalytics is easy to use and is powered by your own participants’ account data. With its almost unlimited reporting capabilities, it will enable you to draw intelligent conclusions about your plans and participants to drive a sound investment and participation strategy. Monitor performance, participation and investment behavior of everybody! planAnalytics measures and analyzes many different aspects of employer-sponsored retirement plans important to your sponsor clients. You likely perform administration and quarterly reviews. Empower your clients with the ability to drill-down and analyze their own plans with great precision, anytime. Responsive! Interactive HTML5 charts and tables show results in real-time. Drill Down! View investment and participation status of any participant. Filter by any investment or census data attribute. 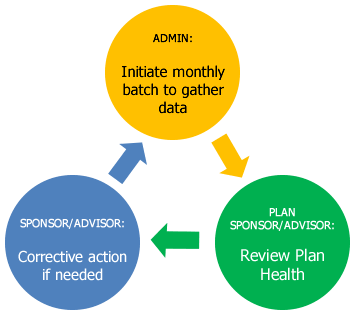 planAnalytics is designed for use by plan sponsors, plan administrators, TPAs, advisors, fiduciaries, and recordkeepers. planAnalytics content can easily be integrated within your plan sponsor web portal, and customized and styled to match your corporate branding and identity. planAnalytics' detailed reports and real-time interface keeps track of participation, performance, activity and plan assets. Monitor participant demographics such as age, tenure, location, compensation, gender, contributions, ending balances, highest, lowest and median personal rates of return, balances, and much more. planAnalytics is built using responsive web design techniques making it suitable for mobile computing platforms such as tablets. planAnalytics is offered as a cloud solution using big data analysis techniques. More information here. planAnalytics helps your clients recognize favorable or negative investment and participation trends and helps them decide whether or not action is merited, for example when an investment option needs to be replaced. Groups of employees not participing. Review reasons for low enrollment; determine how to encourage them to participate based on their employee profile. Participants who are not contributing enough to maximize their employer match. Revisit education strategy; communicate effects on retirement income goals and benefits of increased contributions. Employees who are not allocating according to age appropriate asset classes. Communicate risks of inappropriate allocations; determine strategy to affect change. Investment options that are performing poorly. Determine whether there are compelling reasons to offer these funds, and the risks of not making any changes. Participants causing increased fund inflows / outflows; excess trading; market timing. Address any undesirable participant behavior.